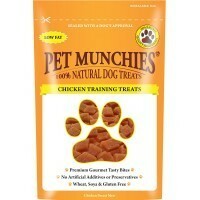 Pet Munchies Chicken Training Treats are premium gourmet tasty bites, made from the finest chicken breast meat. Perfect to give for training, as a reward, or simply for pleasure, the treats have all been delicately baked in their own natural juices to enhance the flavour and make them more palatable. Pet Munchies Training Treats are all naturally low in fat, made without artificial additives, preservatives, flavours or colours, and are suitable for puppies and dogs of all sizes. Wheat, Soya and Gluten free. Chicken Breast min 62%, Glycerin, Starch, Albumen, Salt.